Company profileGerrards (Precious Metals) Limited has been trading since 1981 and is a wholly owned subsidiary of The Lawrence Group. 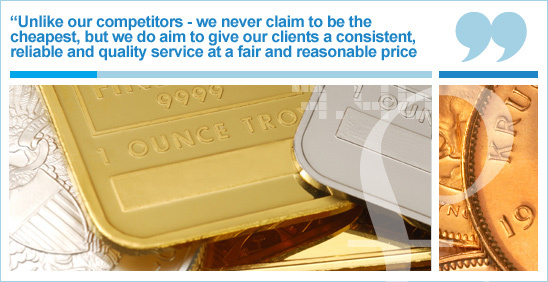 The holding company has had an affiliation to the jewellery and precious metals industry for over 50 years. The company was initially formed after receiving a small but regular number of trade enquiries as to its willingness to buy scrap gold bars. Gerrards traded relatively small amounts of gold in the belief that the business could eventually be expanded. During the 1980's the quantity of business expanded enormously as the gold and silver price went through the roof. As prices returned to stable levels the company increased the range and types of precious metals it could handle incorporating materials from outside the jewellery sector to include dental and other industrial scrap. The company also began to supply new and semi-fabricated precious metal products through its jointly owned subsidiary Auro Argento PLC. The subsidiary company was later sold to a trade buyer. As the century headed towards its end and competitors gradually dropped out of the market we began to expand into the buying and selling of end of line and second hand jewellery. We subsequently became a victim of our own success and were unable to meet the demands of our clients. In the last few years we have successfully worked with jewellery manufacturers both in the UK and abroad to bring a large range of gold jewellery to the market at competitive prices to help supply that demand.